Ferrets use their mouths and teeth to explore their world as well as play, eat and communicate. Ferrets lack sharp claws and use their teeth as their main defense against danger. However, regular small nibbles to get attention from their owners is normal behavior. At times ferrets will bite due to physical pain, illness, feeling frightened or not knowing that their biting behavior is not welcome. Ferrets can get overly excited when playing. They bite and roughhouse with their toys; at times their focus of this playful behavior will be a human toe or finger. In this case, the ferret is just playing, however, he may not be aware of his powerful bite. Distract the ferret from biting humans by giving him a toy. Allow him to put his focus on playing and chasing the toy. Scruffing is a popular technique that naturally shows the ferret who is in charge, proving that his current behavior is not welcome. Gently and quickly grasp the loose skin on the back of the ferret's neck with one hand, lifting the ferret's front two paws slightly off of the floor. At the same time, use your other hand to close his mouth and hold it shut for about five seconds. A strong-toned verbal command of the word "no" is an added helpful tip that will get your point across. Bitter tasting spray-on aids prevent and stop ferrets from biting objects. Only spray the objects that are never to be bitten. Before playing with a ferret, spray a little of the spray onto the tips of human fingers and toes to prevent biting during playtime. Beware, and make sure not to put fingers near your eyes or mouth after spraying. 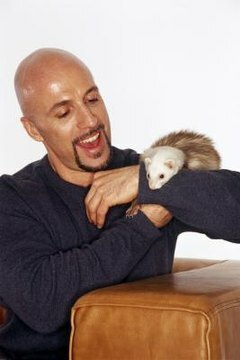 The training aid is extremely bitter and will stop the ferret from biting that object. Some ferrets may not be affected by the bitter tasting spray, in which case, use an alternate training technique. React immediately after the ferret's biting behavior was exhibited. Scruff the ferret by picking him up from the loose skin on the back of his neck, then quickly put him in his carrying case or crate. Allow him to stay in the time-out for up to five minutes, then release him. Repeat this technique when necessary. This technique is especially beneficial when training kits. Kits have an abundance of energy; being on time-out and confined to a small space will be punishment enough and teach them not to repeat the unwelcome behavior that put them in that position.